The Port El Kantaoui marina project was developed in the 1970s as a major tourist attraction and part of the Tunisian master plan for the development included the construction of an 18-hole golf course. British architect Commander John Harris was involved in the early stages of this work and he assembled a design team around Peter Thomson, Michael Wolveridge and Ron Fream to manage the project. By the time the initial 18-holes at El Kantaoui opened in 1980, Ron Fream was the only member of the group left in the country and he would go on to design several other Tunisian courses, including another on this site during the 1990s. El Kantaoui held the first Tunsian Open in 1982 – the first time the European Tour ever ventured outside Europe – but this event only remained on the circuit for four years before disappearing from the professional golfing calendar. With the acquisition of more land, the proprietors were able to extend the golf facility with an additional 18 holes that were added to the complex in two phases during the 1990s. The new course became the Panorama and the old course was named Sea. The fairly flat fairways on the front nine of the Sea course are set in a loop around some residential properties but the routing on the back nine is much more adventurous. After taking an underpass to cross a road at the 11th, golfers play holes 12 to 15 beside the sea with the par four 14th laid out along the Mediterranean shoreline. 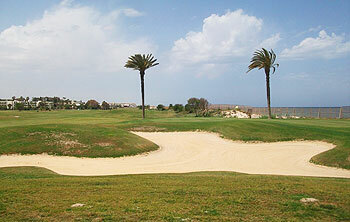 I really enjoyed my first game of golf in Tunisia on the Sea course at the El Kantaoui golf resort. The two short par fours at the 2nd and 6th are excellent holes and they’re easily the best on the front nine. The former sports a wickedly sloping green that cants from left to right and the latter plays to a narrow green situated beyond a deep fairway depression, next to a lovely old whitewashed building. If I’m honest, the three par threes (at holes 4, 13 and 16) were a big disappointment, made memorable only by the fact that the L-shaped layout on the first two greens reduced long distance putting through the grass fringe to a somewhat farcical level. The sequence of four holes that touch the coast midway through the back nine is very good (apart from the aforementioned bland 13th) and they precede a really tough finishing hole where the home green sits alongside the 18th on the Panorama course behind an intimidating lake. There’s good, honest resort golf to be played here which will satisfy, if not exactly thrill, visiting golfers.